Turkey hunting can be one of the most addictive of all the hunting pursuits. But turkey hunting, like most big game hunting, can also be quite dangerous if you do not take the right kinds of precautions. Safety is key to make sure a safe and enjoyable wild turkey hunting expedition. Here are some important turkey safety tips that you do not want to ignore. Ignore them at your own peril. One of the most important things you can do as a safe wild turkey hunter is to take care with your target identification. When you are preparing to shoot, you simply cannot be 99.9 percent certain that are aiming at a wild turkey. You need to be exactly 100 percent sure that you are taking aim at a wild turkey. Make sure that you are aiming at a turkey with a beard before you decide to pull the trigger. Many catastrophes and tragedies have been known to occur when the hunter misidentified their target before taking aim. One of the worst things you could do is to use a gobble call on a spring hunt. This increases your chances of getting shot by another wild turkey hunter who mistakes you for a wild turkey. Although this sounds unlikely, it has been known to happen. This is especially dangerous if you are hunting in an area that is crowded with hunters during the busy spring hunting season. 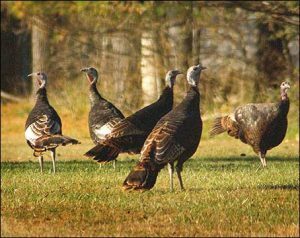 Busy hunting areas are often filled with less experienced wild game hunters, who may be more likely to shoot indiscriminately in the direction of what they thought was a wild turkey. What you wear during your hunting expedition can make the difference between being safe and not being safe. You should always dress defensively when you are hunting. Make certain to wear full camouflage before heading out to the field. You should wear camouflage from your head to your toes. When you wear partial camouflage, the exposed parts of your body may cause you to appear like parts of a turkey. There are certain colors that you should avoid wearing, including blue, white and black. This includes undergarments and the socks you wear. These colors are often associated with wild turkeys. When it comes to choosing a safe calling position, you want to choose a position where you can get an unobstructed view of tree limbs, boughs or branches. You don’t want any bushes or trees to obstruct your view. The best possible position would be at the base of a tree. The trunk should be ideally wider than your body to protect your back. When you want to signal an approaching hunter, you should never wave, make a turkey call or whistle. Another hunter may confuse these signals. In order to signal another hunter safely, use your voice. In a clear voice, call out to the other hunter. There are many ways to use a decoy safely. You should always place it so that you are located far from the direct line of fire of the decoy. If you are moving through the woods, always conceal your decoy completely using camouflage or a bright fluorescent orange color. This way, your decoy will not be mistaken for a live turkey. This is an important hunting strategy that can help you keep safe in the woods. Many novices make the mistake of ‘stalking’ their prey, moving about the woods after them. The less you move, the safer you will be. This is the most effective way to hunt, as well as a safe way to stay out of the direct line of fire of other wild game hunters.